This wasp freezing spray is a highly effective way to kill the entire colony and keep them from coming after you while you are doing so. This well known spray is very effective at killing the entire colony with a strong foamy spray that can be used from 27 feet away. This all natural spray is a great alternative to the strong and dangerous insecticides and it works just as well. Wasps and hornets can become quite an issue for homeowners. They are capable of building their nests anywhere and over time have grown stronger and more resistant to insecticides. This means we have to be more strategic about how we get rid of them. You want the best product to take care of the job, so you do not have to worry about wasps around your family and friends and in this article, we are looking at three of the best wasp sprays money can buy. It provides a fertilizer source too. It is safe to use around pets. It repels a variety of pests. It covers 12,000 square feet. This spray is for the more extreme situations because it is powerful and capable of taking out large nests. 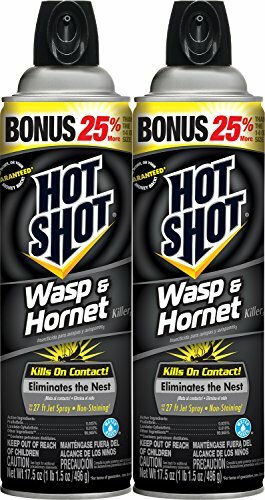 The goal of this spray is to immediately kill on contact, so you do not have to deal with any hornets coming after you from inside the nest. 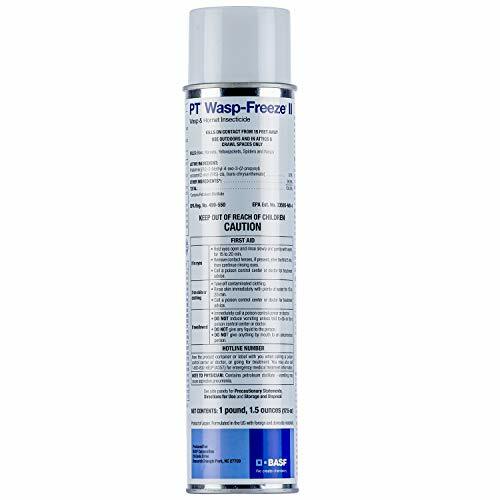 The spray works to do just that by freezing the wasps, and within minutes you will be able to knock the nest down and forget about it. The manufacturer does strongly warn users that this spray does stain clothing and it will kill any plants or flowers it comes in contact with so be careful when using it. That’s a trade-off you get for an extremely useful wasp killer. This spray is similar to the previous one, and it has a strong reputation. Hot Shot is highly affordable and comes with two 17.5 ounce spray cans. The spray creates a durable foam that kills wasps, hornets, and yellow jackets on contact. The can sprays up to 27 feet, so you do not have to get too close to the nest. This spray does not stain clothing or kill anything it comes in contact with, but you do not want to get too close because it could be dangerous if it gets in your eyes or mouth. Wondercide is an all-natural spray that is safe around children and pets. This spray is safe to be sprayed on anything because it does not cause stains. Wondercide contains all-natural ingredients so it can be sprayed directly on the skin to keep insects away. 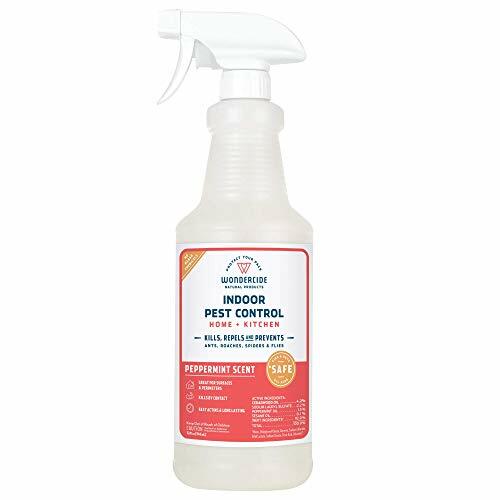 The spray kills over 100 different home pests including wasps and hornets. The main ingredients that repel pests in the spray are peppermint and lemongrass which wasps and hornets hate the smell of. The scent is quite sweet, so you do not mind spraying it around the house on furniture and other fabrics. Not everything you see is a wasp and not every wasp is the same, so it’s essential to identify the different types. We want to make sure you have everything you need to keep wasps away from you for good. All of the products above will kill wasps and hornets, but that is useless if you have to keep killing them every day. The primary goal should be to keep them away, and we want to help you do that. In this section, we are looking at a few ways to make sure you do not have to ever deal with wasps again. A huge misunderstanding a lot of people have is that every stinging insect that is yellow and black is a wasp. Not everything you see is a wasp and not every wasp is the same, so it’s essential to identify the different types. Some of them are completely harmless while others are violent and confrontational. Yellow Jacket is not a type of wasp at all it is a term used to describe wasps and hornets’ yellow stripes. Hornets are the ones you need to look out for. They are typically larger than most wasps and are easy to aggravate. They build the large nests underneath branches and inside boxes where they are less likely to be found. Bald-Faced Hornets are equally as dangerous and will attack in large quantities if you aggravate them. They are black and white, and you do not want to play around with these. Hire a professional to take care of them. The most effective and visible way of keeping wasps away is to remove anything that might attract them to your area. Wasps love sugar so anything sweet will draw them in quickly. If soda was spilled or a glass of wine and it was not cleaned up, you can almost guarantee you will have wasps flying around that area. In the same way that these sweet treats attract wasps to your living space-it can also push them to another location. You can use a sugar water blend and place it in areas where you don’t mind the wasps being. This method is a way to cohabitate with them without worrying about being stung. If you are feeling extra daring and you want to go right for the colony be sure to do so carefully and only play around with the milder-mannered wasps. Wasps typically are out during the day, so that is the right time to knock it down. It helps to have a spray killer with you just in case the wasps come after you. If the nest is small enough, you could even relocate it by approaching it carefully at night when the colony is asleep. You take a plastic container and pluck it from whatever it is holding it and place the lid on it so the wasps cannot escape. Once you find an ideal location, you can release the nest there.